This is quick sweep of UK activities regarding Climate Change and Carbon Reduction, consisting mainly of some (subjective) extracts from the web. This Carbon Brief chart from Feb 2016 shows which Countries in the EU are transitioning the fastest away from fossil fuels, and which are moving at a slower pace. 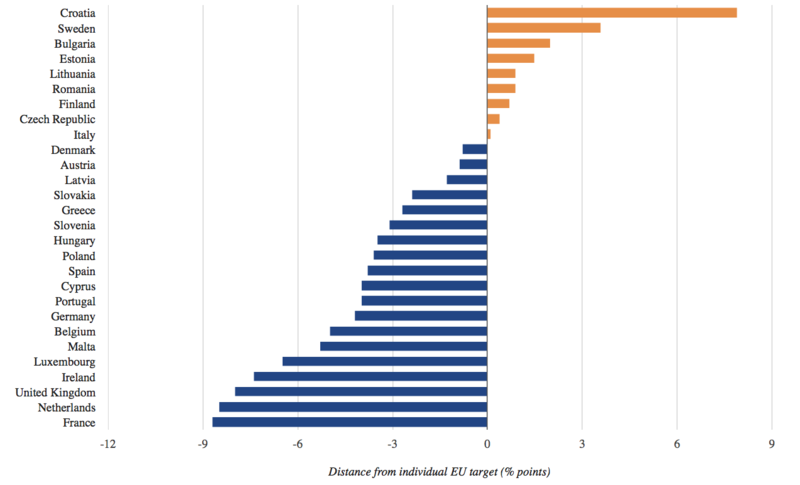 The UK is nearly the furthest away from its agreed EU target. The Committee on Climate Change (CCC) is an independent, statutory body established under the Climate Change Act 2008 to advise the UK Government on reducing greenhouse gas emissions and preparing for climate change. This act: “commits the UK to reducing emissions by at least 80% in 2050 from 1990 levels“. 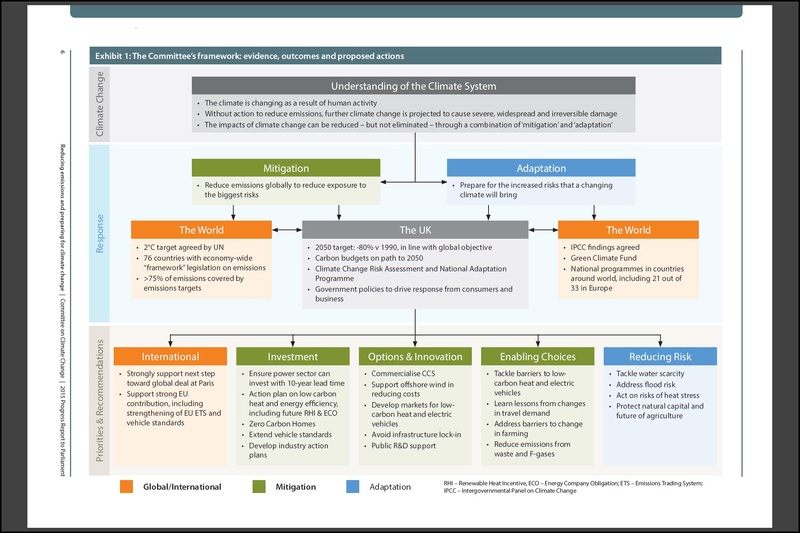 The Nov 2015 ‘5th Carbon Budget’ is discussed by Carbon Brief with discussion on whether the 61% reduction by 2030 can be achieved since the recent backward steps have been taken.. The Smart Power of the title is illustrated by the diagram below, showing how power will become more localised and 2-way. The report also takes into account the increase in the use of electricity for heat and transport – providing potential for demand management and local use to match production peaks and troughs. 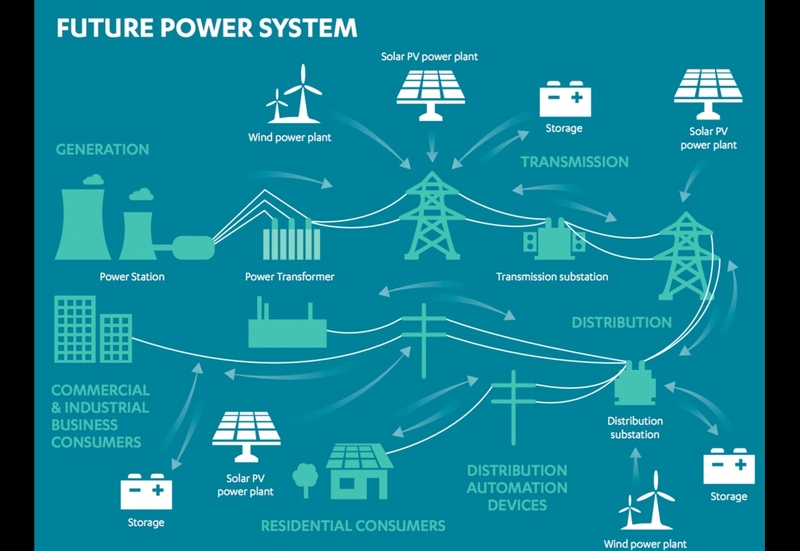 source: Smart Power from the National Infrastructure Commission. Neocarbon Energy has an interactive schematic that demonstrates that each country, the UK included, can manage the peaks and troughs of 21st Century power sources. To counter a campaign by the Global Warming Policy Foundation that the smart UK infrastructure is too expensive and only required due to ‘unreliable’ renewable generation Carbon Brief reported in Dec 2016 on the actual benefits and estimated savings of £8bn to the UK each year by 2030 of the upgrade. Conservative Party Climate Change Position – Post Election. Ms Rudd asserted that “We are on track for our next two carbon budgets.” – disputed by Carbon Brief’s report on her DECC department’s new analysis showing the shortfall in meeting the fourth carbon budget. See Drill or Drop for a long list of fracking activity across the UK in Spring 2016. But fracking may not occur, whether due to a) lack of profitability in the Fracking industry, (“Because of the constant need to drill, frackers are always raising more and more money by selling equity, securing bank loans, and selling junk bonds. Many are already heavily indebted“) or b) successful opposition by UK people. In this case the growth of gas fired power taking over from coal fired is likely to continue, though renewable sources are very low carbon and quick to install. The Leader of the Oppostion, Jeremy Corbyn published ‘Protecting Our Planet‘ in July 2015 laying out the aims of the Labour Party: “Britain should commit to playing a leading role in getting the world on track to climate safety – with the UK cutting our fair share of carbon at home. We must take action now to keep fossil fuels in the ground – end dirty energy handouts, ban fracking and set a target date to end new fossil fuel extraction, and begin to phase out high polluting coal power stations with support for workers to re-train. It is therefore the lead department in global negotiations, including the UN convention on climate change. See ‘COP21 . See the Friends of the Earth assessment on the UK’s contribution as being unfair. Reliable, Affordable and Clean Energy Supplies UK issues per electricity source (from lowest carbon emitters to highest) are illustrated at ‘Fuel for UK Electricity‘. If the overriding objective is to emit as little carbon as possible it is not clear if the money available in the UK (from Government, individuals and companies) is being used to best effect as ‘whole life’ cost per kWh is not published for all fuel types equally. For instance, it looks as though Nuclear clean up takes the bulk of UK energy funds, but the cost of future Nuclear clean up does not seem to be considered in the same way as repayment to individual Solar generators is. The other stated objectives of secure energy and affordable energy also effect policy. These are addressed by the Electricity Market Reform that “introduces two key mechanisms to provide incentives for the investment required in our energy infrastructure. however the auction awarded (electricity customers) money to existing generators, regardless of carbon emissions and did not encourage new capacity. Byron Orme, of the Institute for Public Policy Research (IPPR) concluded in March 2016 that “the government’s capacity market is broken”…..”it provides continuing subsidies to fossil fuel generators, and highly polluting diesel plants, at a time when the UK is trying to decarbonise its electricity system”…. “the energy market now has two contradictory policies working against one another – the carbon price floor penalises coal-fired power stations at the same time as the capacity market rewards them.” And Alan Whitehead MP discusses the April 2016 IPPR Report explaining how the capacity auctions open to new and existing power producers inevitably have led to the contract prices not reflecting the extra cost of investing in new sources and hence subsidises and perpetuates old (paid off) sources. The result is high cost and no new (low carbon) capacity. Other objectives seem to include reducing fuel poverty, reducing air pollution, encouraging UK business, ensuring that the electrification of transport uses clean fuel and acknowledging local wishes. None of these objectives are being furthered by the Capacity Market. For instance, Community Energy (Pre election) supports communities generating their own energy. Post election it is becoming much more onerous, requiring participation in Neighbourhood Planning Forums for new onshore wind turbines (Giving local people the final say over onshore wind farms) whilst local people’s wishes can be overridden by the Government where Fracking is proposed (Government will step in if councils don’t fast-track fracking applications). 1010 ran a campaign to allow Community energy to be sold and used locally, rather than having to sell to the Grid for a low export price to a Utility that will sell it to neighbours for a high price. They have formed an Energy Local Club in Bethesda Wales with their local hydro plant and Co-operative Energy to demonstrate how this model can work. Electric Vehicle batteries Up to £10 million is available for a consortium to develop a pilot line for production of a variety of electric vehicle batteries. Again, this is mainly owned by BEIS . Investment is covered by the UK Green Investment Bank (oft quoted as evidence of a Green Government)”We have invested in every part of the UK and across all our target sectors, backing large projects with a capital expenditure of more than £1bn and small projects of £2m. We have set up five funds to specifically target smaller projects.” See panel on Biofuels for effect on carbon. Employment: The move to a low carbon economy has a significant effect on jobs. Local power generation provides local jobs – large scale deployment provides concentrations of jobs and the chance for the UK to develop global expertise. No specific activities to consider employment relating to low carbon have been discovered. BEIS owns several schemes that were set up to encourage installation of renewable power and heat as well as the Green Deal intended to fund ‘green measures’ for householders. The Green Deal is being discontinued from July 2015. The Dept Communities and Local Government (DCLG) holds the levers for property energy levels (other than FITs/RHI/ECO) owning the national regulations for Planners and Building Inspectors to apply to new properties and major renovations. Reducing energy use in Transport. Vehicle Emissions – Regarding vehicle emissions there is more action. See the Committee on Climate Change blog on the emissions gap whereby the test environment for testing emissions testing (as well as understating pollutants) understates CO2 emissions. The Plug-in Car Grant (PiCG) has been guaranteed until the end of March 2018, of up to £4,500 for a fully electric car. For cars registered prior to April 2017 UK Car Tax depends on the carbon emissions, ranging from £0 for up to 100 to £1,100 for over 255. However at that date (keeping electric cars at £0) all cars will be £145 a year after the first year (that will range from £10 to £1,000). See Money Savings Expert for full rates. The Dept of Transport is supporting for research into ‘Novel Low Carbon Transport Fuels, such as waste and geothermal. Livestock were identified by the UNs Livestock’s Long Shadow as “The livestock sector emerges as one of the top two or three most significant contributors to the most serious environmental problems, at every scale from local to global. The findings of this report suggest that it should be a major policy focus when dealing with problems of land degradation, climate change and air pollution, water shortage and water pollution and loss of biodiversity. However no UK policies to reduce carbon emissions across this brief have been discovered to include here. In summary the UK has many initiatives aimed at reducing carbon emissions, but, according to the CCC, insufficient to meet our pledges. Parliamentary debate 10th June 2015.